The first Halloween film is a modern horror classic. The second one continues the same story, picking up immediately after the previous film had left off. These first two films technically take place on the same Halloween night, and then Michael Myers vanished until the fourth film in the series. The third film strayed from the storyline to have a plot about some haunted masks instead, but the fourth film is a return of sorts. Both Halloween 4 and Halloween 5 continue the story of Michael Myers, and he remains human rather than supernatural despite how unbelievable his survival in each film may seem. Halloween 4: The Return of Michael Myers brings back the original storyline, minus Jamie Lee Curtis as the sister under attack. Instead it is her daughter who is targeted by Michael. Jamie Lloyd (Danielle Harris) is just a small child, but she is helped by her babysitter and cousin, Rachel (Ellie Cornell). These two spend the next two films attempting escape from Michael, over the course of two different Halloween nights. In Halloween 4, Rachel agrees to baby-sit her cousin begrudgingly only to discover that they are being hunted down by an escaped killer. How Michael is able to continuously escape as well as survive the brutal onslaught that ends his reign each film is a mystery. This is another where Michael is able to escape during transport and makes his way back to his hometown, apparently now able to drive. The fourth film is famous for amping up the amount of gore as well as a twist ending that is somewhat discarded for the next film. 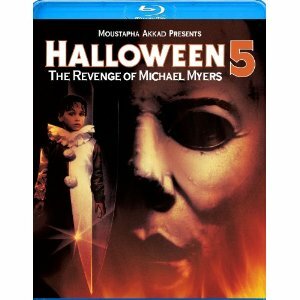 Halloween 5: The Revenge of Michael Myers has the same characters and continues the storyline in a similar way that was successful with the first two films. Both Rachel and Jamie are back as the victims of a once again attacking Michael Myers. By now there is no question about his destructive abilities and after he was gunned down only to survive, there is no telling how he can be stopped. 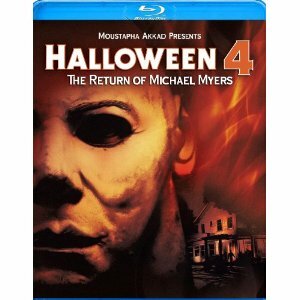 The Blu-ray release of Halloween 4 has two audio commentaries; one with actors Ellie Cornell and Danielle Harries and another with director Dwight H. Little and author Justin Beahm. There is also a discussion panel for the fourth and fifth film in the series. Halloween 5 also has two audio commentaries, and also separates the actors from the filmmakers. The actor commentary has Danielle Harris, Don Shanks and Jeffrey Landman. The filmmaker commentary has director Dominique Othenin-Girard and author Justin Beahm. There is also an on-set featurette and both films have the original promo material. Cuba Gooding Jr. has had a strange career. He struggled to get to the top, doing small roles until he made huge waves with one of them. After his supporting performance in Jerry Maguire garnered him an Academy Award, it seemed that the world was at his feet. Instead of making more movies like the one that made him famous, however, Gooding Jr. started making family films in desperation. When those did little to help his career, he began popping up in many straight-to-video action films. Now he seems to have made a niche for himself as an assassin in low budget films, which One in the Chamber simply helps to confirm. 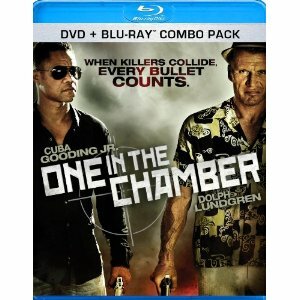 Though One in the Chamber is in every way a straight-to-video action film, it is far better than most. The directing is still poor, the dialogue ridiculous and the supporting acting atrocious, but this one has decent action and the inclusion of Dolph Lundgren to help elevate the film slightly. The storyline isn’t half bad either, pitting two trained assassins hired by feuding crime families against each other. Ray Carver (Gooding Jr.) is a skilled assassin whose failure at a job in Prague begins an Eastern European mob war. The rival gang hires a man known as “The Wolf” (Lundgren) to clean up the mess, which leads to an inevitable confrontation with Ray. There are many double crosses and twists in the storyline, but we are all truly just paying the price to watch this film in order to see these two stars fight. They do fight, which can appear somewhat comical when considering their size difference, but the action is otherwise fairly solid. The Blu-ray release includes a behind-the-scenes featurette, though the real reason is the high definition presentation of mediocre action. 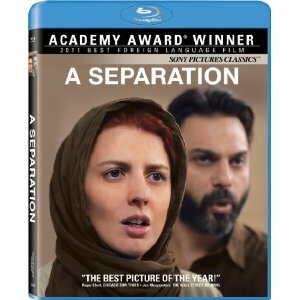 The Best Foreign Language Film winner of this past year was the Iranian drama, A Separation. The film is about the dissolution of a marriage in modern day Iran, but at the center of the film is an event which ends up taking over the plot of the film. It is interesting, because trouble brings the separated couple back together, though their separation is the ultimate point of the film. It is a complex movie in which every character is relatable and logical in their own way, though this does not prevent them from conflicting with other logical and reasonable thinking minds of opposing views. The film’s highly debated moment comes after a series of events. Simin wants to leave Iran with her husband Nader and daughter Termeh. This is possible because they have visas, but they are also about to expire. In an act of desperation, Simin sues her husband for divorce and moves out to live with her parents. Nader doesn’t want to leave because he feels responsible for his Alzheimer’s-inflicted father. Without his wife to help, Nader is forced to hire a woman to help out. The woman is a devout Muslim, having difficulty with the task of helping an elderly man. Her husband is even more religious, which is why she keeps her job from him. When Nader returns home to find his father tied to his bed and locked up in his room, he fires the woman, who then sues him after an accident outside of his doorstep. There is a bit of discrepancy over what really happened and who is to blame for what, but it all comes out in court. The interesting aspect of the film is watching the way that Nader and Simin interact during the conflict, and how they return to their stale mate once it has been resolved. The Blu-ray includes a commentary track with writer/director Asghar Farhadi, as well as two featurettes about the filmmaker. All nature films and television programs are quite spectacular these days, mostly because of the advances in the equipment used to capture the images. High definition nature programs truly became a phenomenon with the success of the “Planet Earth” series, which Disney released as a family-friendly film. Ever since Earth there have been a stream of additional nature films from the studio, including Oceans, African Cats and now Chimpanzee; the most intimately remarkable of them all. While all nature films and programs now have remarkable images, Chimpanzee stands out with a remarkable story. This is the kind of thing that can’t be planned, and it is miraculous to have happened at all, not to mention on camera. The story follows a young chimp lovingly nicknamed Oscar. When this little chimp is orphaned at a young age, he is forced to look for a new mother in the pack to take care of him. This leads to an unexpected partnership which must be seen to be believed. It is a heartwarming story that is perfect for the whole family, only further enhanced by the spectacular high definition presentation of Blu-ray. The 2-Disc Combo Pack includes both a Blu-ray and DVD copy of the film. 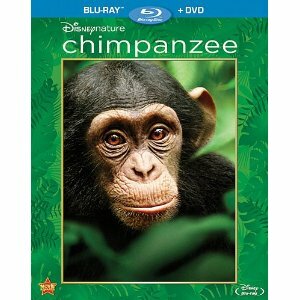 The DVD has three featurettes about nature conservation and Disney’s involvement. These three are all included on the Blu-ray, as well as interesting special features. There is a great making-of featurette, which shows the obstacles faced along the way. Some of these were shown in the credits, but there is much more that was not shown. There is also a music video and a making-of feature for the music video. The straight-to-video sequels which come from Disney Home Entertainment aren’t even made in the same studios that created the theatrical originals, so it is no wonder why they never seem to capture the same successful essence. 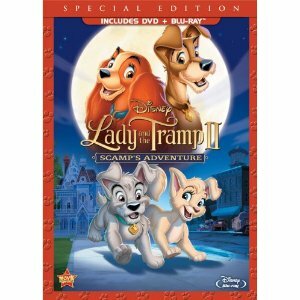 Lady and the Tramp II: Scamp’s Adventure is typical in every way as far as these sequels are concerned, which is far from a stellar recommendation. Even when the animation is close, the story could never be close to the original, which remains one of my favorite Disney films. So perhaps I am somewhat biased. This time around it isn’t technically about Lady and the Tramp, not only because the story follows different characters, but also because the street dog is female this time and the lady is more of a gentleman. Scamp is the rambunctious only son of Lady and Tramp, who is now completely domesticated. Scamp must have developed the rambling nature of his father somehow, and he is desperate to explore beyond the confines of the yard. This leads Scamp to make friends with a street dog named Angel, giving him the chance to see what it is like on the other side. This makes the sequel somewhat of the same story as the original in reverse, and eventually Scamp makes his way home again. The Blu-ray combo pack comes with an additional DVD copy of the film. The special features include a sing-a-long for the songs, a puppy trivia track, three bonus cartoons with Pluto, and a making-of featurette. There is also an audio commentary, but the main reason for this upgrade is the high definition presentation of the adequately animated sequel. In the minds of many Disney lovers, there were two great periods for the animation studio; the 1940s-60s when most of their beloved classics were created, and during the 90s when a revival of great Disney animation occurred. The 1970s and 80s are mostly ignored, and at a certain point after the stream of good 90s films, the focus disappeared from the studio. That is, until they started releasing Pixar’s film. I would say that it was around the time of Pocahontas, Tarzan and Mulan that the Disney films of the 1990s fell off. Pocahontas may be one of the last great ones, though it isn’t nearly as great as The Little Mermaid, Beauty and the Beast or Aladdin. Pocahontas takes a stab at a kid-friendly telling of the romance between settler John Smith and an Indian named Pocahontas. They have a star-crossed-lover romance in the new world, with each able to share their different traditions with each other. This romance is destined to be short-lived, though filled with a number of memorable songs and a completely forgettable sequel to bring them back together again. 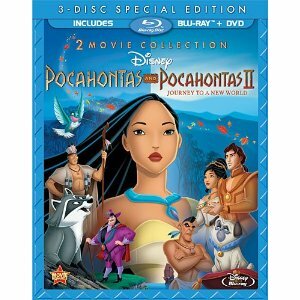 Pocahontas II: Journey to a New World brings Pocahontas into Smith’s world, back in Great Britain. While the first film taught him to appreciate nature, the second has Pocahontas as the fish out of water. For the first time on Blu-ray, this 3-Disc special edition has both films on Blu-ray and also on DVD. The Blu-ray has the space to hold both films, whereas the remaining two discs are DVDs of both films separately. Although many purists may not go out of their way to purchase the sequel, there is no denying the appeal of having it available in a double-feature release. There are also a number of all-new special features, including “Drawing Inspiration: The Lost Story of Hiwatha,” which tells the original film was drawn from an idea Walt Disney were once developing. There is also a deleted song by Alan Menken and Stephen Schwartz, which is amazingly fully animated and in high definition. There are plenty more additional features, but nothing is quite as worthwhile as the upgrade in visuals and audio which comes with the high definition presentation. In the Paris of 1910 a delicate and upper-class cat and her three kittens are thrown into an adventure in the streets of Paris when their owner’s butler decides to dispose of them from the house. From here the film follows a familiar story of class issues, although they are not addressed as much as they are in other Disney classics. Immediately after they are left to die by the evil butler who has heard that his master’s estate will be left to the cats instead of him, they are discovered by an optimistic alley cat named Thomas O’Malley. Even though they are from different worlds Thomas and Duchess fall in love during their journey back to their home, and even though it seems like they don’t fit in each other’s world the film proves that the two classes can be joined by the end. The music in The Aristocats is filled with beloved classics and some great numbers with a French flair and feline fundamentals. The opening song was sung by Maurice Chevalier, a famed singer who came out of retirement just to sing this one last song for the film. 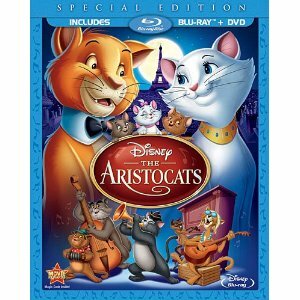 Also included in the film’s music is a jazz influence, which shows up in the lower class alley cat’s home, but eventually marries into the upper-class household with Duchess and a closing jazz song with the whole team of cats. Along with the jazzy soundtrack comes some great colorful animation, filling in the holes of the very simple story. As wonderful as this simplistic Disney film is, following a pattern of choosing an animal and a location to tell a fun story, the DVD was sadly lacking anything impressive as far as special features were concerned. The best part is usually the film, but after a little of time searching through the special features I realized the best ones were just clips of the film that I longed to watch again. There is an unnecessary waste of time with two games, although I can appreciate that a young child may be amused temporarily by these distractions. The Blu-ray release has a few welcome additions, as well as the ones from the DVD which left me unimpressed. The brand-new bonus features include a featurette with Richard Sherman with an alternate beginning sequence, a deleted character and a deleted song with a demo that has the Sherman brothers singing together. The music section merely plays the songs from the film, without any of the dialogue scenes, whereas the backstage section has a little more meat to it, although not much. There is an extremely short featurette with the Sherman Brothers, who created the music for the film. They pound away the songs at a piano and tell the story of their experience. There is also an excerpt from another Disney program, obviously released on television as a way of anticipating the new film about cats. It is just an excerpt, but there is Walt Disney as a host and a cartoon to show the different cats in “The Great Cat Family”. There is also a scrapbook and a deleted musical scene shown with still frames and an old recording. Looking throughout the history of Disney, there have been a lot of mice. From Mickey on, there have been a lot of animated mice characters in Disney films. Cinderella has her friends and helpers, Dumbo has a lone defender and companion and even Sherlock Holmes appeared as one in The Great Mouse Detective. So, it should come as no surprise that there is an elite group of international animated mice who gather to solve the problems of the world. These problems usually include a captured or kidnapped child, and the same two mice are able to rescue them. 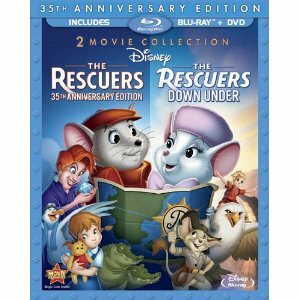 The classic film, The Rescuers, is released as the 35th Anniversary Edition. When a small child sends a distress sign via empty bottle out to sea, a group of rescue mice intercept it and call an emergency meeting. Top agent Bianca from Sweden chooses Bernard, the janitor, as her companion on the mission. They venture into the swamps of Devil’s Bayou, battling against the wicked diamond hunters and pet crocodiles to free the child. Bernard and Bianca return again in the sequel many years later, The Rescuers Down Under. This time the couple must travel to Australia to free another child from the grips of a poacher seeking an endangered eagle. Both films are fit onto one Blu-ray disc in this two-movie collection. There are also DVD copies of the films as well, though I would highly recommend watching the Blu-ray if at all possible. Animation is one of the few mediums which is undeniably enhanced by the high definition presentation of Blu-ray discs. The special features include a deleted song, a Silly Symphonies animated short, a sing-a-long song and a making-of featurette. These are all included on the DVDs as well. Winnie the Pooh is a character that has stayed the same over years, only slightly adjusted since the voice actors have been changed. The Tigger Movie was a reintroduction of these characters with a few new actors stepping in to do voices, including John Hurt who provides the voice of the narrator. Later Piglet would also get his own film, but the characters are all present and significantly used. The story which takes primary focus, however, is Tigger’s search for his family tree, unaware that it can’t be physically found. Tigger wants to know if there are other Tigger-like animals, and at times is forced to settle with the zealous Roo. For the first time since Bedknobs and Broomsticks (1971) former Disney composers Richard M. Sherman and Robert B. Sherman created the music for the Disney studios, and it was ultimately the last they would compose for the studio. As a result there is a great deal of emphasis on the music, which is entirely fitting for Winnie the Pooh and gang. The animation also has a nostalgic feel to it, with a much simpler style that makes the film feel comforting and familiar. 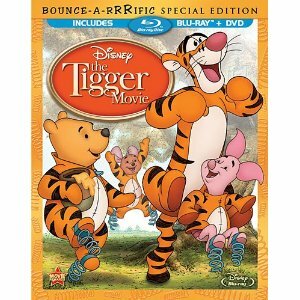 The Bounce-A-Rific Blu-ray Edition of The Tigger Movie includes a DVD and an HD digital copy of the film. The DVD special features have been transferred over for the Blu-ray. There are featurettes, including a trivia game, a matching game, a sing-a-long, a DVD storybook and a music video. There are also episodes from “The New Adventures of Winnie the Pooh,” which is actually older than The Tigger Movie and on DVD for the first time here. Exclusive to the Blu-ray are two all-new special features. There is the Disney Intermission feature, which allows viewers to interact and participate in games whenever the film is paused. There is also a featurette about the history and creation of the Tigger character, and how that played into the making of this film. With the countless films that continue to drive the zombie film to the forefront of the horror genre, it is not surprising that a zombie television series was finally created. Vampire series are now cliché and predictable, mirrored after Twilight. “The Walking Dead” seems to be similarly drawn to the plot which brought back a new type of zombie film in the genre. Both Zack Snyder and Danny Boyle had their zombies run rather than walk in the Dawn of the Dead remake and 28 Days Later. “The Walking Dead” allows the same, though perhaps with a little less ferocity. This bloody AMC series also begins in the same manner as 28 Days Later; our protagonist awakens from a coma in a hospital to find that the world has completely fallen apart. County Sheriff Rick Grimes (Andrew Lincoln) awakens from a coma and discovers that his town is abandoned. His wife and child are gone, so he sets out to find them, discovering along the way that there are undead walking and hunting living flesh. He eventually finds other people, and they band a group together for survival. The cities are over-run with zombies, and the only chance is to hide from the mass of undead. The series is spectacularly well done, created by Frank Darabont who also directs select episodes. Darabont is best known for his Steven King adaptations, most remarkably the prison ones (Shawshank Redemption, Green Mile). The last one he made, however, seems closest to the style of “The Walking Dead.” The Mist was a horror film about a group of survivors trapped in a grocery store. “The Walking Dead” is a spectacular series about the difficulties of this type of post-apocalyptic lifestyle as well as the threat of being eaten. The first season was only six episodes, which seemed like plenty with the high quality of production. Season two more than doubles the amount of episodes, and takes the storyline in all-new directions. First they must leave the city, since they have discovered that there is no help to be found. This journey away is detoured when one of the vehicles breaks down and one of the members of the survivors is shot in a random hunting accident. There is also a missing member of the group and all of the twists and turns left unresolved from the first season. As well as an increase in episodes, there has also been an increase in the treatment of the series on Blu-ray. 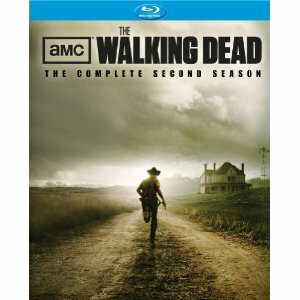 The four-disc set includes all of the episodes for season two and 11 featurettes about the production from every gory aspect to actor’s opinions. There are also six webisodes and audio commentaries on five of the episodes from season two. There are also a handful of deleted scenes from select episodes.